In reading this excerpt from today's IRS Newswire, I find it troubling that the IRS is not copying those of us who have Powers of Attorney on file, because the taxpayers who have collection issues, often don't open all their IRS mail, and sometimes don't fully read and understand the notices. Why on earth would the IRS not copy us on these notices? And is this something that NcCPAp could influence in the future? Here is the excerpt: "When the IRS certifies a taxpayer to the State Department as owing a seriously delinquent tax debt, they receive a Notice CP508C from the IRS. The notice explains what steps a taxpayer needs to take to resolve the debt. 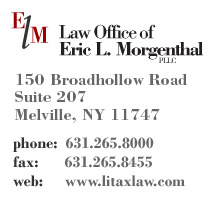 Please note, the IRS doesn't send copies of the notice to powers of attorney." The topic has been a source of contention for taxpayers that travel abroad. For your reference, here's a link to an article I had written last year delineating several issues with the IRS Passport revocation process. Don't hesitate to call if you have any questions. NCCPAP's Tax Committee is bringing this issue to Capitol Hill at our meetings in May. We will keep you updated with any information we get. I had a feeling you might already be on top of this, Sandy! the notice. And many times, this is the POA, more likely than the taxpayer.